by Jeff Campbell, Director of Product Marketing, Canada Sales, Cummins Westport Inc. Ten years ago on March 7, 2001 Cummins Inc. and Westport Innovations officially joined forces to create Cummins Westport Inc. (CWI). This 50/50 joint venture was the culmination of three years of collaboration between the two companies focused on how best to grow the medium- and heavy-duty natural gas vehicle market. 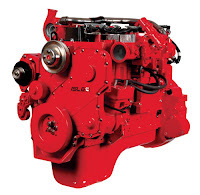 Since this humble start in 2001, CWI has emerged as the leading natural gas engine supplier to bus and truck builders worldwide, and has also been recognized with many awards along the way. Since 2001, CWI has sold over 21,600 natural gas and LPG engines worldwide and generated cumulative revenues of $545 million. For these successes, we thank the foresight of our CWI founders, the direction from our Board of Directors, and the dedication and perseverance of CWI’s 52 staff members in: Columbus, IN; Denver, CO; Hubbard, OH; Irvine, CA; Miami, FL, Vancouver, BC; Beijing, China; and Darlington, England as well as field support from the Cummins’ distribution channel worldwide. Thanks also go to everyone at Cummins who has had a role in CWI's successes in the first ten years. We look forward to CWI's continued success in the next ten!